This is no time to run the hot oven, but for those of us who love baking, there must be something we can do. 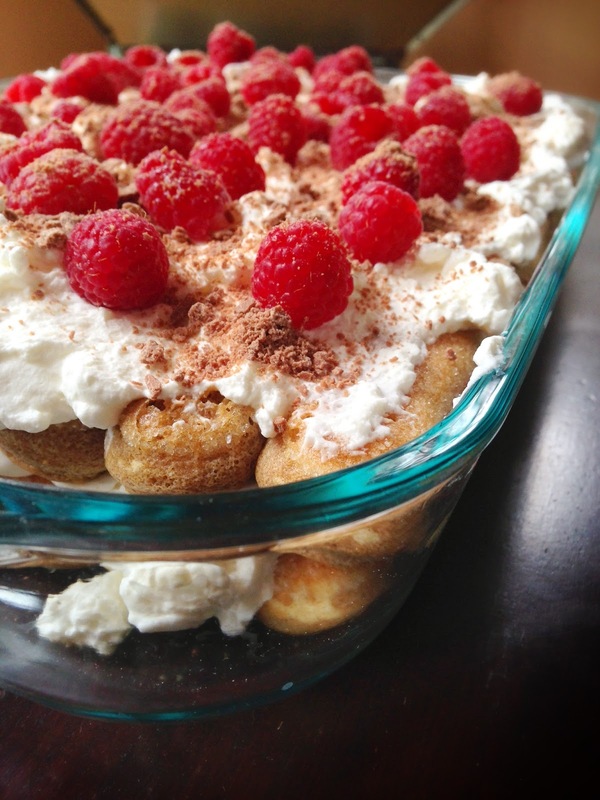 Enter Tiramisu, a luscious Italian dessert made with delicate ladyfinger cookies soaked in rum and coffee, sandwiched between fluffy white cloud s made of whipped cream and mascarpone cheese, crowned with crushed chocolate and fresh raspberries. Tiramisu means pick me up in Italian, making it just what the doctor ordered after an exhausting day in the hot summer sun. Unless you are a superhero baker like my friend Fariba of Zozo Baking, you don’t need to bake anything. She makes baking your own ladyfinger cookies look so easy, but I’m what you call lazy. That’s right. No need to run the oven at all, which is a blessing now that the mercury is rising. A quick trip to your local Italian deli, Middle Eastern grocery store or Trader Joe’s for a packet of ready-made cookies imported from Italy, some mascarpone cheese and you’re ready to get started. This little sweetheart is actually much better the next day, after everything has softened nicely and the flavors have developed. The classic recipe is often printed right on the side of the ladyfingers package, but I have made a few changes of my own. These lightly sweet cookies are first dipped into freshly brewed espresso and Kahlua, which is a rum and coffee liqueur. The traditional recipe usually calls for raw egg yolks which I omitted years ago when my sister was pregnant and haven’t missed since then. There should be a generous dusting of cocoa powder on top, but I find the cocoa just absorbs moisture in the fridge, then looks rather unappealing. Grated chocolate holds up much better and tastes better, especially when you top every layer with it. Then, for the final touch, a good drizzle of decadent chocolate sauce is optional, but highly recommended. There really are no rules or exact measurements in making tiramisu. You can toss one together with whatever you have on hand and improvise as you go. Make the coffee and transfer it to a shallow pie dish. Add Kahlua. Whip heavy cream with vanilla until fluffy. 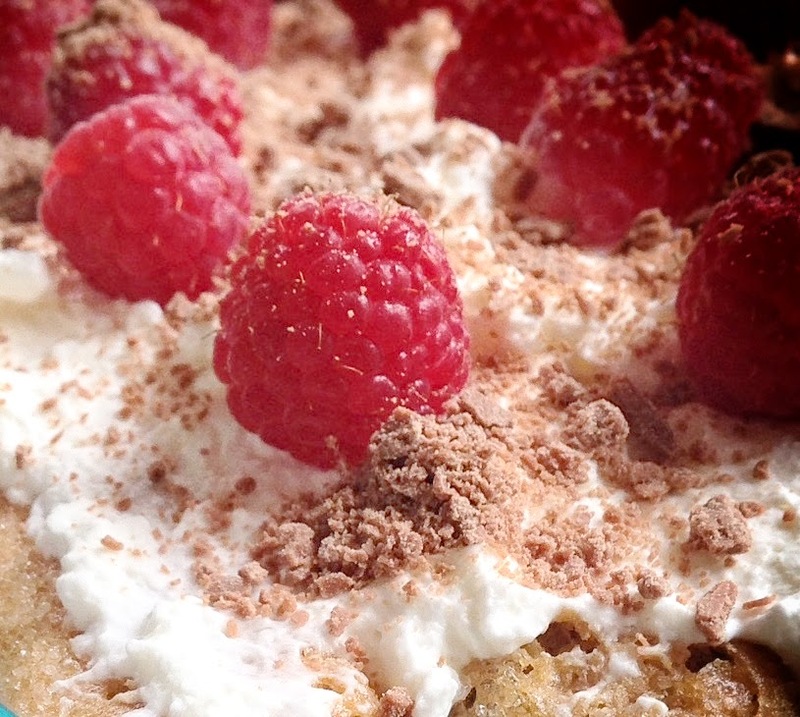 Gently fold mascarpone into the whipped cream. an idea how many you’ll need to cover a layer. 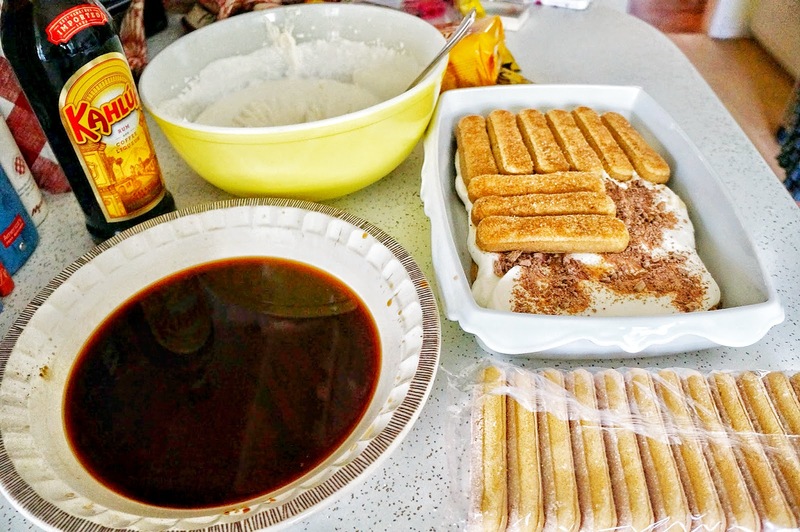 Dip cookies one at a time into the coffee + rum mixture, flipping twice and arrange evenly into the casserole pan. Spoon half of the cream + cheese layer over the cookies. Crush the Flake chocolate in the packet before opening it. 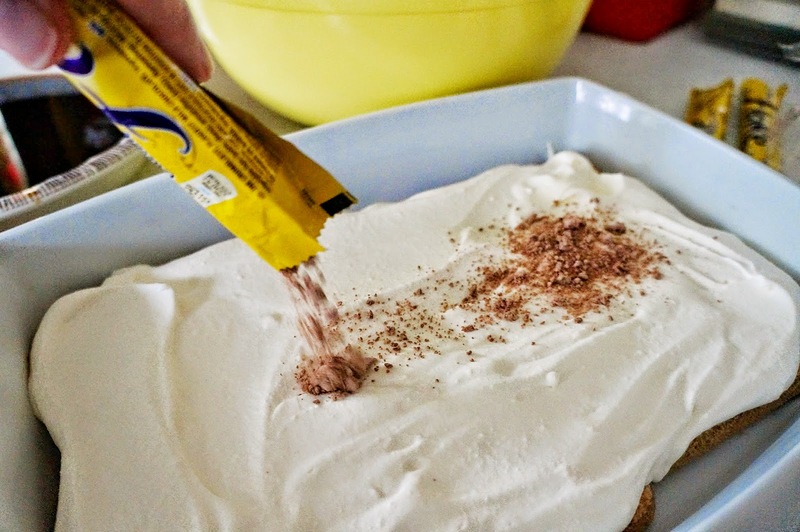 Open one end and sprinkle chocolate over the whipped cream + cheese. 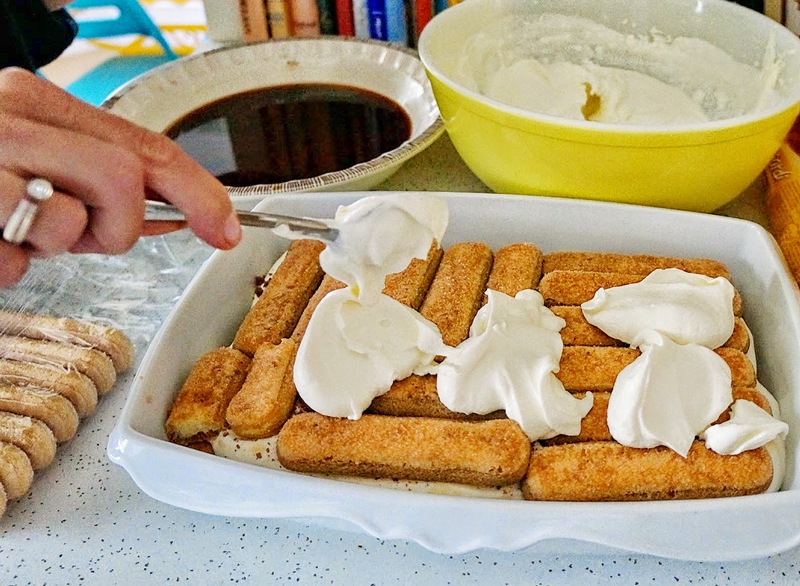 Repeat with another layer of soaked ladyfingers and fluffy whipped cream + mascarpone. Top with the last of the chocolate. Arrange raspberries over the chocolate and drizzle with chocolate sauce. Originally, it should be coffee and cocoa, but don’t be afraid to change the flavors. I’ve done a lemon blueberry version that was out of this world. Tiramisu is a luxurious dessert that comes together in a blink. It is so much fun to make, especially with the kids, because unlike traditional baking, there are no exact measurements, no worries about oven temperature. You can make it large enough to feed an army or small another to treat that special someone. It’s light and refreshing with a lovely boost from its mild sweetness and kick from espresso. It’s Italy’s answer to icebox cake. The longer it chills in the fridge, the more irresistible it tastes. Dear Colette, I am a true tiramisù lover – your version with all those wonderful, summery fresh raspberries looks absolutely delicious! We are having a rather hot summer this year, so your no-bake version sounds like a great idea to me! Have a great weekend with your very lovely family! Love the idea of not fussing with eggs! Yeh, I'm not shy with chocolate! Joumana, the yolks do add flavor, but then I'm stuck with what to do with the whites. So leaving them out yields a lighter version, more appropriate for its name. Tiramisu is best in the summer when you'd hate to run the hot oven.